As you see, we have ‘If’ clause at one side and conditional clause at the other. We have already learned the “If” clause in the previous lesson. No problem with that! Now let us translate “I would come” to Tulu. Tulu: yAn lett’NDa I baiduvana? English: Would you come if I called you? Kannada: nAnu karedre, nInu bartiddeya? Tulu: yAn leid’NDa I baiduvana? English: Would you have come if I had called you? Kannada: nAnu karedidre nInu bartiddeya? Tulu: yAn lett’NDa I baidayana? English: Wouldn’t you come if I called you? Kannada: nAnu karedre, nInu bartiralilva? Tulu: yAn leid’NDa I baidayana? English: Wouldn’t you have come if I had called you? Kannada: nAnu karedidre nInu bartiralilva? 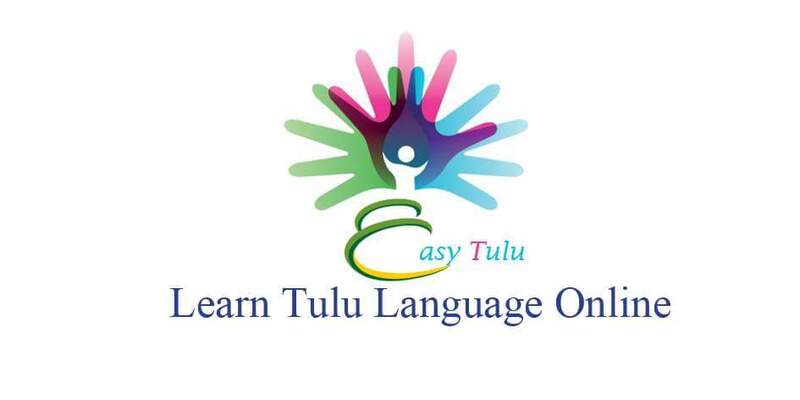 The conditional mood in Tulu can also be used to talk about something you wanted to do but didn't, or regretting what you did or didn't do. Tulu: yAn ninan tUyere baiduvae! nikk hushAr ijjandinau enk gottittiji. English: I would have come to see you! I didn’t know you were ill.
Kannada: nAnu ninnannu nODOke bartidde! ninage hushAr illaddu nange gottiralilla. English: I would have loaned you the money, but I didn’t have any. Tulu: Chae! yAn vantae bEga baiduvae! English: I wish I had come little earlier! Kannada: Che! nAnu svalpa bEga bartidde! Tulu: Chae! I eNDa pantuva! English: I wish you had told me! Kannada: Che! nInu nannalli hELtidde! If I help you, will you help me? As you see, we have two sentences. We have ‘If’ clause at one side and main clause at the other. 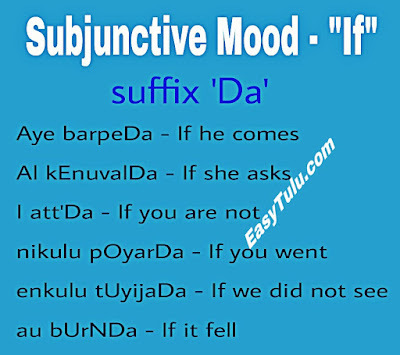 In Tulu ‘If’ clause can be formed by adding the suffix ‘Da’ to the verb conjugations in all tenses. Alright! 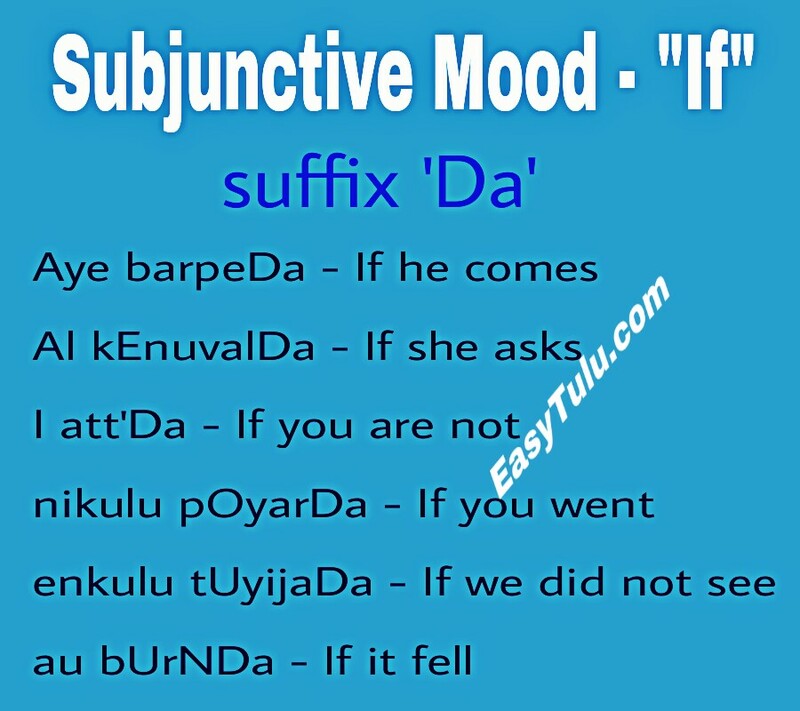 Let us conjugate the verb ‘bar’ (barpini - To do) in subjunctive mood in all tenses. Note: In Tulu we use Present Perfect with 'If' clause while in English it is Past Perfect. 3. If I help you, will you help me? Will you help me? – I enk sAya malpuvana? Tulu: yAn nikk sAya malpuveDa, I enk sAya malpuvana? English: If I help you, will you help me? Kannada: nAnu ninage sahAya mADidare, nInu nanage sahAya mADuttIya? Tulu: yAn nikk sAya malt’NDa, I enk sAya malpuvana? 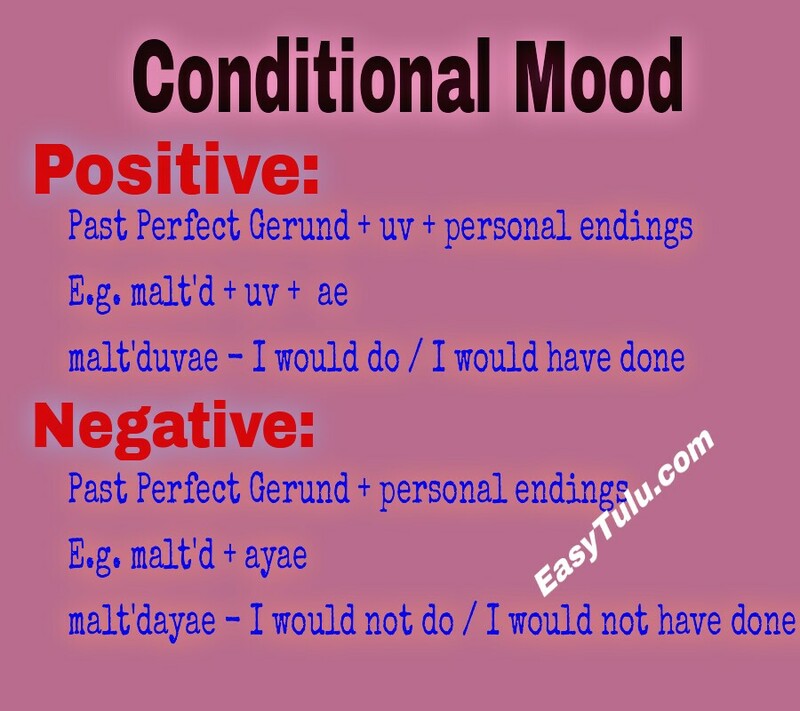 As you see, above sentences are future conditional sentences, but we used the third person neuter past tense singular (lett’NDa, batt’NDa and malt’NDa) while translating ‘If’ clause. Today we are learning only future conditional sentences. 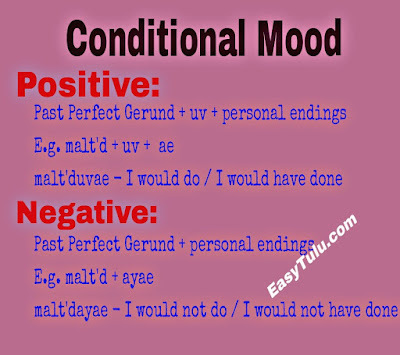 Next week we will go to the past conditional sentences. Tulu: ANDa, enk onji sAya malpuvana? English: If possible, can you do me a favor? Kannada: Adre, nanage ondu sahAya mADuttIya? Tulu: I att’Da, bEtae Er? English: If not you, who else? Kannada: nInu alladidre, bEre yAru? The word ‘mini’ may have different meanings when used in sentences. Englsih: Do you know by any chance? English: Will they come by any chance?